Telecommunication is a vital infrastructure that enables convenient and smart world. Upon the popularization of internet and smartphones, the society is evolving into a new format at an unprecedented speed. LG U+ believes that our responsibility lies on making changes into the one that produces positive outcome and contributes to the healthy growth of communities. LG U+’ goal is not on simply earning profits but creating shared-value that embraces both economy, society and environment values and achieving sustainable growth in return. 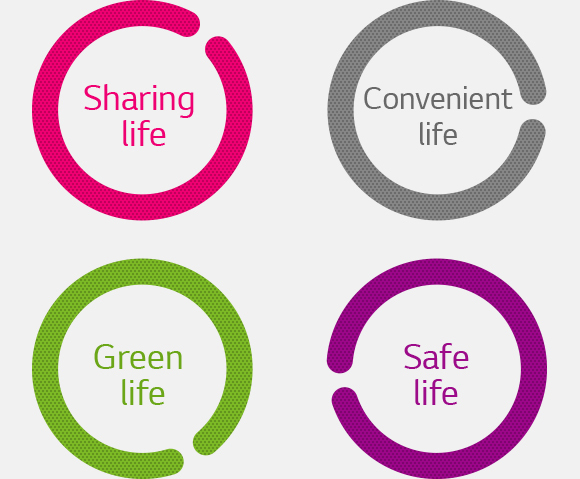 With ‘Sharing Life’, ‘Convenient Life’, ‘Safe Life’ and ‘Green Life’ as the 4 core value areas, LG U+ finds the related issues and reinforces the power of each value. ‘Sharing Life’ means that LG U+ grows with all its stakeholders through win-win relationships. ‘Convenient Life’ means the ICT services that promote a convenient life for customers. ‘Safe Life’ means the services that resolve security issues. Finally, ‘Green Life’ means the recognition of climate change issues and promotion of green projects. LG U+ will sincerely live according to the 4 core value areas, and develop projects which link services with common interests, contributing to sustainable growth.